We want to introduce you Aphrodite A, which is the second figure from the Mazinger Z collectibles line. Aphrodite A is a fully-articulated (including the fingers) and highly detailed collectible figure that stands 15" (approximately 38cm) tall and includes light-up LED eyes, cockpit and afterburners on her backpack . 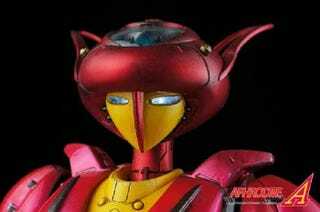 In correspondence to the upgrades she receives in Mazinger Z story, Aphrodite A also includes Koushiryoku Missile that actually eject from her chest. Aphrodite A is a giant mech originally built as a symbol for peace by Dr. Yumi from the remains of Aphrodite for geological research. Although this mech originally lacked weapons, it was later upgraded for combat with the Koushiryoku Missile for offensive battle so that his daughter, Sayaka Yumi could pilot Aphrodite A alongside Koji Kabuto in Mazinger Z.
Mazinger Z is a Japanese manga written and illustrated by Go Nagai in 1972 that has since been adapted and continued in various multimedia formats including various manga, anime and video game incarnations. The original manga and anime tell the story of Koji Kabuto and the titular mecha Mazinger Z as they fight the Mechanical Beasts of Dr. Hell with the support of his partner and love interest, Sayaka in Aphrodite A, and his younger brother Shiro Kabuto. Aphrodite A specs: * figure stands 15 inches (approximately 38cm) tall. * highly detail mechanic parts. * incredibly paint application to highlight all the details with weathering effect. * fully posable figure.